When it gets late into the summer, I enjoy patrolling the edge of the pond outside my place to stay sharp on meadowhawks. 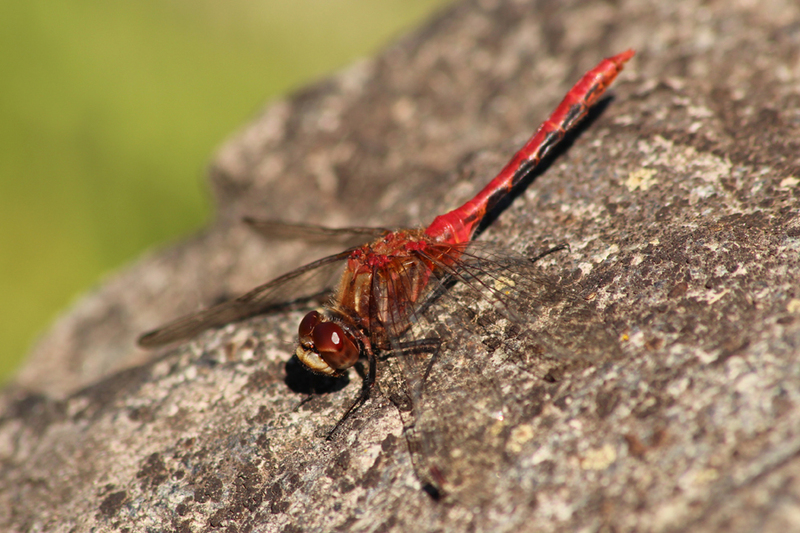 In the Victoria area, we certainly have Sympetrum diversity on our side with nine of the ten species found in province occurring locally. Around the pond outside my place, I have noted seven species of meadowhawk. The crown jewel of my pond's meadowhawk list is Cherry-faced Meadowhawk, which had not been recorded on Vancouver Island before I found one on the grass, caught it by hand, and took some close-up photos that confirmed its identity. That may be the most notable meadowhawk I have found here, but I personally enjoy seeing Autumn Meadowhawks the most of the seven. The common name for it used to be Yellow-legged Meadowhawk, which is an equally fitting name. Autumn Meadowhawk is named as such because it is the meadowhawk with the latest flight period. 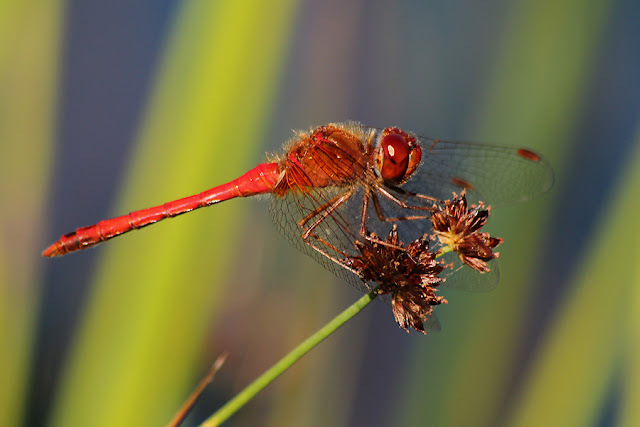 By late September, only a few species of meadowhawk are still flying and Autumn Meadowhawk is known to be on the wing as late as mid-November. The old common name, Yellow-legged Meadowhawk, is nice because it refers to a visual feature: as adults they have yellow-brown legs. Other small meadowhawks found here have black legs, so it is quite noticeable when you spot a vibrant red dragonfly with dingy legs. Today, I grabbed my camera and did a few laps around the pond hoping to find a cooperative Autumn Meadowhawk. It took a while to wade through all the Striped Meadowhawks and find something different, but eventually I noticed one that was just a touch smaller and had a brighter, poppy red abdomen. My next step was to check out the thorax to ensure it didn't have the telltale stripes of a Striped Meadowhawk. Everything was looking promising as the individual in question had a solid bronzy-red thorax. Then, to seal the deal, the diagnostic yellow-brown leg check, which also passed my inspection. To put the icing on the cake, the Autumn Meadowhawk was posing nicely on a rush. I crouched down and snapped off several shots before it zipped off as a darner darted low over it. Poppy red abdomen... check! Solid bronzy-red thorax... check! Yellow-brown legs... check! Perfect Autumn Meadowhawk! Although it will appear quite obvious from close-up photos, I nabbed a few shots of a Striped Meadowhawk for comparison. The stripes on the side and front of the thorax are a dead giveaway you've got a Striped Meadowhawk! Dragonfly diversity is still quite high, so get out to your local pond and see what you can find. Perhaps you'll be able to put your Autumn Meadowhawk skills to the test?